James, you may recall was one of the three Philp children who left Scotland in 1863 and sailed on the Queen of Beauty to Auckland. He became a newspaper reporter. and family moved from New Zealand in 1888, settled in Sydney and later moved to Brisbane. In both cities he had a distinguished career in the newspaper business. 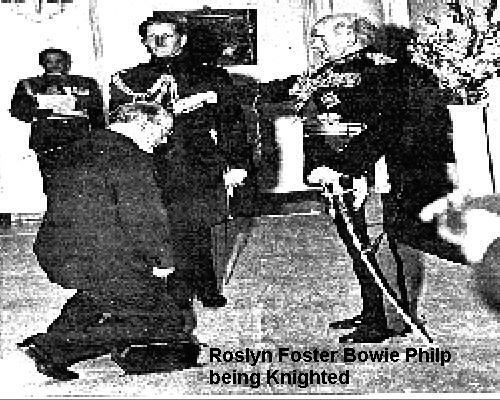 James' son, his grandson, Roslyn Foster Bowie Philp was knighted in 1958 for his services to the Queensland bar. As we saw in an earlier chapter Alexander Bowie, with his marriage to Margaret Hill was a bit of a social climber and I am sure that he would be delighted that about his grandson's knighthood. 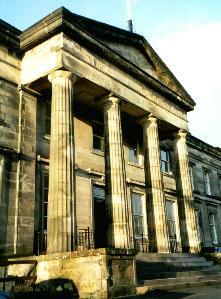 The following rather, poor quality photograph, records that event. Sir Roslyn's Grandson, Andrew Philp a barrister in Cairns Queensland , was the first descendant that I traced and spoke to. A son of Sir Roslyn and Ellen Kilgour Ross was born on the 20th March 1923. During the second world war he servrd with the RAAF and latterly was bases in 161 Bomber Commaand out of Tempsford airfield. This was the place from which all secret operstions behind enemy lines were flown and on the night of 6th October 1944 Ross's plane was intercepted by a German fighter over Vemb in Denmark and shot down. 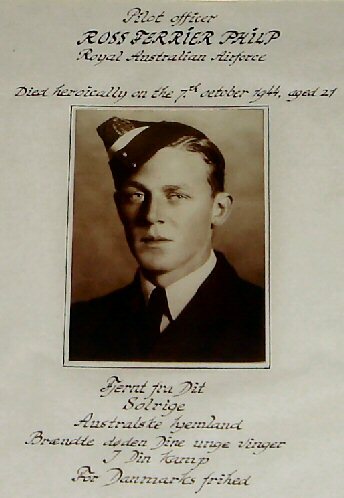 The other crew members escaped alive, although wounded, but sadly at the age of 21 Ross was killed by the fighter's bullets.